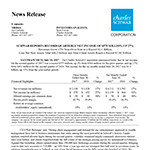 "The resulting 630 basis point gap between revenue and expense growth yielded a 42.7% pre-tax profit margin and once again demonstrated our ability to successfully balance near-term profitability with reinvestment to drive long-term growth." 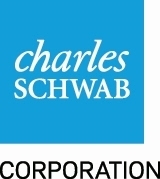 SAN FRANCISCO--(BUSINESS WIRE)--The Charles Schwab Corporation announced today that its net income for the second quarter of 2017 was a record $575 million, up 2% from $564 million for the prior quarter, and up 27% from $452 million for the second quarter of 2016. Net income for the six months ended June 30, 2017 was $1.1 billion, up 32% from the year-earlier period. Note: All per-share results are rounded to the nearest cent, based on weighted-average diluted common shares outstanding. Effective January 1, 2017, a new accounting standard prospectively changes the treatment of a portion of the tax deductions relating to equity compensation. These deductions were previously reflected in additional paid-in capital, a component of stockholders’ equity, and are now included in taxes on income, a component of net income. The company’s tax expense for the second quarter and first half of 2017 decreased by approximately $5 million and $36 million, respectively, as a result of this change. Future effects will depend on the company’s share price, restricted stock vesting, and the volume of equity incentive options exercised. New retail brokerage accounts for the quarter totaled approximately 232,000, up 36% year-over-year; total accounts were 7.3 million, up 4% year-over-year. Opened three new company branches and one independent branch; completed two relocations. Schwab has over 340 branches across the country that offer clients access to a range of investing and personal finance services. Launched a new account summary page on Schwab.com, making it easier for clients to track their portfolios and manage investments across all of their Schwab accounts. Held the annual EXPLORE® conference for the company’s top independent advisor clients. Schwab leadership and keynote speakers discussed the state of the industry and global economies. Initiated the transition for advisor firms to Schwab Advisor StreetSmart Edge™, providing streaming real-time quotes, advanced charting, and additional trading capabilities; full conversion will be completed throughout 2017. The 2017 RIA Benchmarking Study was released to RIA clients; a record 1,321 firms participated, representing $848 billion in AUM. Topics included client acquisition, marketing, technology, and financial performance. 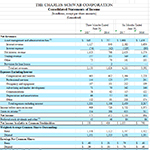 Balance sheet assets = $175.7 billion, up 14% year-over-year. Outstanding mortgage and home equity loans = $11.7 billion, up 5% year-over-year. Pledged Asset Line® balances = $4.0 billion, up 14% year-over-year. Schwab Bank High Yield Investor Checking® accounts = 950,000, with $13.5 billion in balances. Net new assets into proprietary equity and bond funds and ETFs held off the Schwab platform rose 57% year-over-year. Excluding money funds, net flows for proprietary mutual funds, ETFs, and collective trust funds reached a record $8.2 billion for the quarter; net flows for first half of 2017 were also a record at $15.7 billion. Client assets managed by Windhaven® totaled $8.0 billion, down 25% year-over-year. Client assets managed by ThomasPartners® totaled $12.6 billion, up 48% year-over-year. Client assets managed by Intelligent Portfolios (Schwab Intelligent Portfolios® and Institutional Intelligent Portfolios®) totaled $19.4 billion, up 137% year-over-year. Periodically, our Chief Financial Officer provides insight and commentary regarding Schwab’s financial picture at: http://www.aboutschwab.com/investor-relations/cfo-commentary . The most recent commentary was posted on February 28, 2017. This press release contains forward-looking statements relating to the company’s business momentum; strategy; balancing near-term profitability with reinvestment for growth; balance sheet management; investment in growth initiatives; and optimization of the spread earned on client cash sweep balances. Achievement of these expectations and objectives is subject to risks and uncertainties that could cause actual results to differ materially from the expressed expectations. Important factors that may cause such differences include, but are not limited to, client use of the company’s investment advisory services and other products and services; the company’s ability to attract and retain clients and registered investment advisors and grow those relationships and client assets; general market conditions, including the level of interest rates, equity valuations and trading activity; competitive pressures on pricing; the company’s ability to develop and launch new products, services and capabilities in a timely and successful manner; the level of client assets, including cash balances; the company’s ability to manage expenses; capital and liquidity needs and management; the company’s ability to monetize client assets; the timing, amount and impact of bulk transfers; the quality of the company’s balance sheet assets; client sensitivity to interest rates; regulatory guidance; the effect of adverse developments in litigation or regulatory matters and the extent of any charges associated with legal matters; any adverse impact of financial reform legislation and related regulations; and other factors set forth in the company’s most recent reports on Form 10-K and Form 10-Q. 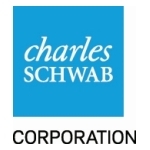 The Charles Schwab Corporation (NYSE: SCHW) is a leading provider of financial services, with more than 340 offices and 10.5 million active brokerage accounts, 1.5 million corporate retirement plan participants, 1.1 million banking accounts, and $3.04 trillion in client assets as of June 30, 2017. Through its operating subsidiaries, the company provides a full range of wealth management, securities brokerage, banking, money management, custody, and financial advisory services to individual investors and independent investment advisors. Its broker-dealer subsidiary, Charles Schwab & Co., Inc. (member SIPC, http://www.sipc.org ), and affiliates offer a complete range of investment services and products including an extensive selection of mutual funds; financial planning and investment advice; retirement plan and equity compensation plan services; referrals to independent fee-based investment advisors; and custodial, operational and trading support for independent, fee-based investment advisors through Schwab Advisor Services. Its banking subsidiary, Charles Schwab Bank (member FDIC and an Equal Housing Lender), provides banking and lending services and products. More information is available at www.schwab.com and www.aboutschwab.com . (1) Includes fee waivers of $1 million and $55 million during the second quarters of 2017 and 2016, respectively, and $9 million and $152 million during the first halves of 2017 and 2016, respectively, relating to Schwab-sponsored money market funds. (2) Taxes on income were reduced by approximately $5 million and $36 million for the three and six months ended June 30, 2017 to reflect the required adoption of Accounting Standards Update 2016-09, which changes the accounting treatment of a portion of the tax deductions relating to equity compensation. (1) Interest revenue was less than $500,000 in the period or periods presented. (2) Advice solutions include managed portfolios, specialized strategies, and customized investment advice. Fee-based advice solutions include Schwab Private Client, Schwab Managed Portfolios, Managed Account Select®, Schwab Advisor Network®, Windhaven® Strategies, ThomasPartners® Dividend Growth Strategy, Schwab Index Advantage® advised retirement plan balances, and Schwab Intelligent AdvisoryTM, launched in March 2017; average client assets are shown exclusive of enrolled balances that do not generate advice fees. Intelligent Portfolios include Schwab Intelligent Portfolios® and Institutional Intelligent Portfolios®. Legacy Non-Fee advice solutions include superseded programs such as Schwab Advisor Source and certain retirement plan balances. Average client assets for advice solutions may also include the asset balances contained in the mutual fund and/or ETF categories listed above. (3) For total end of period client assets receiving ongoing advisory services, including those not generating advice fees, please see the Monthly Activity Report. (4) Includes various asset-related fees, such as trust fees, 401(k) recordkeeping fees, and mutual fund clearing fees and other service fees. Beginning in the first quarter of 2017, a prospective methodology change was made to average client assets relating to 401(k) recordkeeping fees to provide improved insight into the associated fee driver, which resulted in an increase of approximately $25 billion. There was no impact to revenue or the average fee. (5) Includes miscellaneous service and transaction fees relating to mutual funds and ETFs that are not balance-based. (1) Includes proprietary equity and bond funds and ETFs held on and off the Schwab platform. As of June 30, 2017, off-platform equity and bond funds and ETFs were $8.7 billion and $17.2 billion, respectively. (3) Second quarter of 2017 includes inflows of $18.3 billion from a mutual fund clearing services client. First quarter of 2017 includes an outflow of $9.0 billion from a mutual fund clearing services client. Second quarter of 2016 includes an inflow of $2.7 billion from a mutual fund clearing services client. (1) June 2017 includes an inflow of $15.6 billion from a mutual fund clearing services client. February 2017 includes an outflow of $9.0 billion from a mutual fund clearing services client.